Should I be Worried about those Cracks by my Tuning Pins? If you own an older harp, say thirty years old or more, you may be familiar with the little cracks that can develop on either side of the tuning pins, as shown in this photo. In some cases, cracks like these crop up in harps that aren’t so old, especially if they have been subjected to a particurly harsh environment (as in, “my Grandma kept this harp in the garage for 10 years. Do you think it’s okay?”). While I always recommend showing any crack, bulge, or other inconsistency in your harp’s wooden frame to a qualified harp technician, if your harp has cracks like these, chances are there is nothing to worry about. Pedal harps, even hundred-year-old ones, are covered over much of their surfaces in a layer of wood veneer almost as thin as a sheet of paper. the old saying, “beauty is only skin deep” certainly applies to the average harp. The gorgeous birdseye or flame maple pattern on your harp’s body is only a veneer. On most harps made since the 1920’s, when you look at the top of the soundboard you will see its grain running vertically. 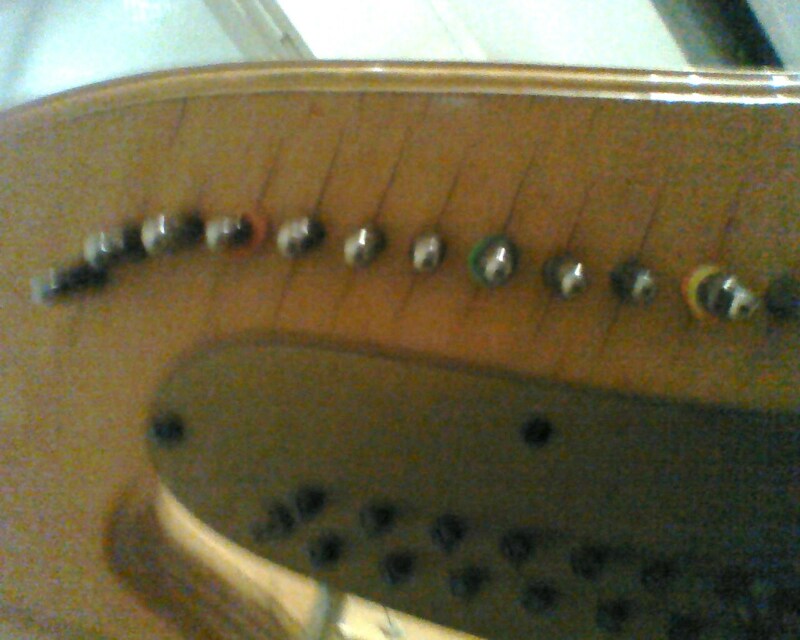 If you take a look at your soundboard from inside the harp’s body, however (use a flashlight if you need to), you will notice the wood grain running horizontally. Again, the outer surface of the soundboard is a veneer, decorating the underlying board. The cracks you see in the photo only extend through the veneer. The structural” bones” of the harp’s neck are most likely intact. This condition should not result in loose or slipping pins. What’s going on, in my opinion, is that the harp’s neck warps to some degree over time, due to the constant pressure of the strings. This causes stress to the veneer, weakening the glue joint which holds it to the underlying wood. In addition, each tuning pin is pulled downward on the string side of the harp (and upwards on the opposite side), causing additional stress on the veneer. Over time, it can crack. The good news is, cracks in laminated wood, i.e. two or more layers of wood glued together, cannot transfer from one layer to the next. Laminates are intentionally glued together at cross grains – meaning their grain directions are perpendicular to one another. This arrangement adds strength and stability, and also prevents the spread of cracks. Could cracks like the ones in this photo be a warning that there may be underlying damage in the next layer of wood? It is possible, but unlikely. If a harp has lived in a harsh environment, there may be further damage underneath the veneer, which could cause problems such as slipping pins. However, I rarely see this. Most of the time the damage goes no further than the outermost layer. If you’re looking at buying an older harp, or see this kind of cropping up on yours, I would certainly bring it to your technician’s attention. They are rarely anything but cosmetic, though, so don’t be too concerned.